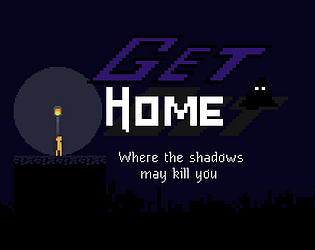 I liked the core mechanic, but I'm not sure what makes this a stealth game, because you're not like infiltrating somewhere, and the enemies are more like monsters that are trying to catch you but aren't protecting anything. Or maybe they're trying to stop you from getting into the building that appears at the end of the game? Apart from that, I enjoyed playing the game and solving its puzzles, the way you guys made use of the light for both surviving and progressing is smart. At the aesthetic level, the game has a good atmosphere, supported by its graphics and sound effects. The music on the main menu cast my mind back to Beneath A Steel Sky. 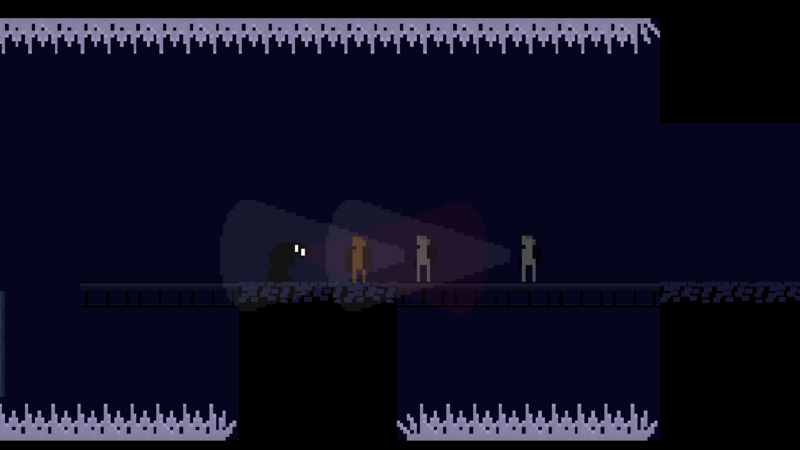 I hope to see more levels, puzzles, and mechanics in a post-jam release. ＿φ( °-°)/ We'll appreciate if you rate and comment our game: Slow Ride. very unique concept with very good execution I loved this game well done. You can go checkout my entry if you pleased it will be nice if you rated and left feedback. That was super cool! I loved your take on the stealth genre, and the theme was super flavorful. I understood the light/shadow mechanic and the dummy mechanic, but not the talk mechanic (I think it causes all the humans to look at you?). Also, one of the scaffolding platforms was bugged. If I jumped while under it, I caught in midair and was then able to spam jump to get on top of the level. Other then that though, I had a lot of fun! I really enjoyed all the different puzzles that had to do with manipulating the enemies, especially once the buttons were introduced. Also, the game just looked really great, the sprites looked good, and the whole thing was super polished. Nice job! Wow! That was incredible!! It was a blast to play and very well polished. I couldn't ever find a use for talking, but the blow-up dummy was super useful. Well executed and genius. Very nice one, I love how the running out anti-stealth meter adds tension to the platforming elements, and how you can use your decoys to distract enemies and to activate pressure plates. The level design is also awesome, even though it gets kinda hard at some points toward the end to see where you're supposed to go. Very cool take on a stealth game. 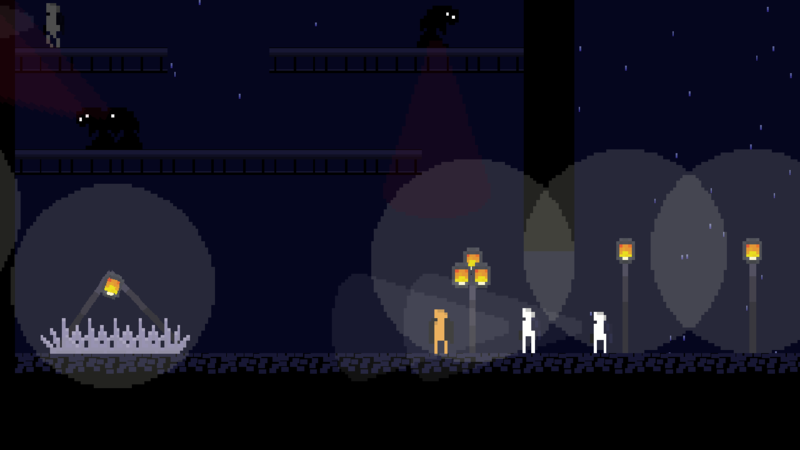 I really liked how you used mechanics in multiple ways, i.e: lampposts as checkpoints and flashlights as enemy-scarers. I would have added an option to run, with the debuff of getting noticed way easier by the enemies, and a more clear controls screen; I didn't realise you had a whip ability after 10 minutes in. I like the idea, but also didn't get the genre and the mechanic that this game is done without. I also didn't know where I need to go. I got stuck at the part two monsters are waiting for me: I cant jump over that. The controls were a bit strange too (jump on the ladder). Therefore I weren't able to go so far in your game. I think the core mechanic currently has little depth to it, consider adding something that you can combine with that, like in one of the best games I saw in this jam: https://lonebot.itch.io/what-goes-up - you can't fall down, but then you have ladders and the hook system to compliment that. Interesting take on stealth but have to stay in the light. So Stealth but you can't stay in the shadows. Good job on your entry! The mood is really great and the gameplay is definitly worth playing. I don't get what mechanic is absent from the genre though but it's a really cool game anyway ! This is a pretty good entry! I think it would've worked better in 3D, but a game such as that would probably take more than 48 hours to build properly. 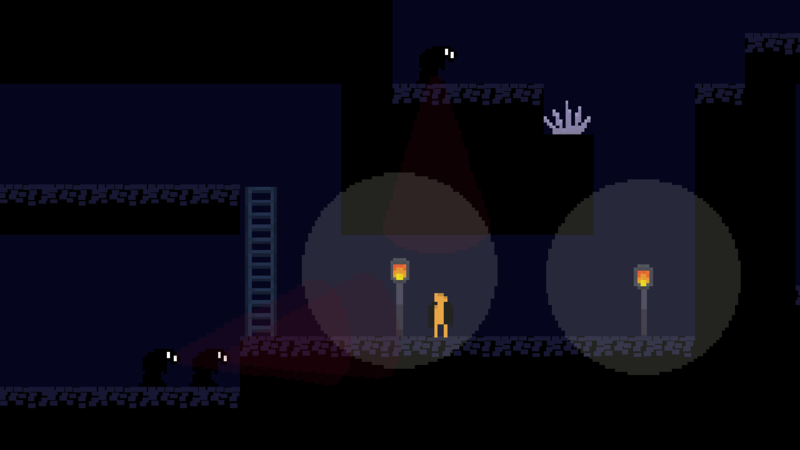 I liked the small "tutorials" you included, like how you could safely observe how the light kills the shadow people before they get to you. I had a fun time playing it, although I would sometimes glitch through the roof while trying to climb ladders. Thankfully it wasn't a huge inconvenience, since you die pretty quickly.